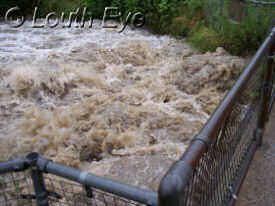 Saturated ground from heavy rains the previous week left Louth at risk of flooding on June 25th. So when further heavy rains were forecast for the whole day there were scenes of rising floodwater in the town. 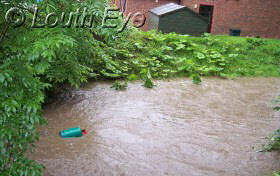 Some residents had sandbags ready, whilst the sound of fire engine sirens was a frequent occurrence all morning. From around midday the flood warning siren was sounded. 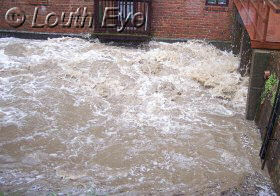 The river Lud and the Louth canal broke its banks in places, particularly around Ramsgate. The swelling waters contained a lot of debris, and gave off a muddy smell thanks to the amount of silt it had picked up. The Environment Agency issued severe flood warnings for the river Lud, and the Louth Canal and tributaries from Louth to Tetney Lock and Waithe Beck from Binbrook to Tetney Lock. Other severe flood warnings within Lincolnshire were for the river Bain and tributaries between Goulceby and Tattershall, and also areas near the Humber tributaries from Barton upon Humber to Humberston. In other words, much of northern and eastern Lincolnshire were affected. One of the worst hit streets within Louth was probably Ramsgate, pictured below left. However, many properties in Westgate had their gardens flooded, and Broadbank and James Street were also badly affected. Police cordoned off areas around the town and the Co-op supermarket had to be closed as a result of the day's high waters. 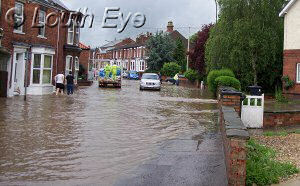 Many children enjoyed the day off school as schools were closed and roads around the county became impassable.